If you’ve just moved into a new home and don’t have a lot of money to spend on a new grill, or you have a very small exterior, it’s best to get a cheap charcoal grill. It’s impossible to talk about cheap charcoal grills without mentioning the name Weber – because the company is all about affordable grills. So, it should come as no surprise that two of my most favorite cheap charcoal grills are made by this company. The Weber 10020 Smokey Joe and the Weber 121020 Go-Anywhere Grill are perfect for those who are strapped for cash or space. Since both are small and lightweight, they can be put away after use or carried to the great outdoors. The first grill has useful features like a 14.5-inch cooking grate, a reinforced nylon handle, and a porcelain-enameled lid and bowl. Weber gives a 10-year limited warranty for it. 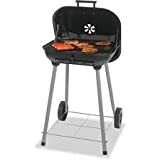 The Weber 121020 Go-Anywhere Grill boasts a large cooking surface (160 square inches), porcelain-enameled coating, and adjustable steel legs that secure its lid. Backyard Grill’s unit also delights me with its wheels that make it easy to move and its 282 square inches of grilling surface. I also like its hinged lid and bottom storage shelf. If a unique grill is what you want, Sougem has got you covered. 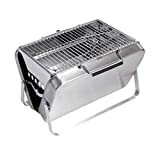 Its grill, which looks like an accordion, has features you will love – like a stainless steel body, airflow holes that prevent ash from sticking to food, and a compact design. ISUMER also holds its own with its foldable tabletop grill which has a large cooking surface (278 square inches). 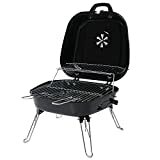 Cheap Charcoal Backyard Grill - Grills up to 15 Burgers. Porcelain enamel cooking grid. 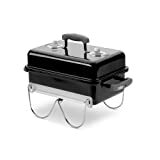 Features: Portable charcoal outdoor grill is made of stainless steel, heat and scratch resistant, and wouldn't get deformed and rusted. Vent design of for charcoal brazier allows the charcoal to get fully burned. Together with the perfect distance between grate and charcoal, food can be cooked faster and no dust will stick on the food.The unique design of grate equipped with 2 handles to adjust the height is convenient for adding charcoal and controlling the barbecue temperature. Foldable & Portable to carry: Removable grate makes cleaning of the barbecue charcoal grill easy. Unfold size of the grill is (length x width x height):15 inches x 11 inches x 10 inches. Folded size is: 15"x 3.5"x 10". Size of portable charcoal camping grill after being folded is just like a small briefcase. Thus, the BBQ grill can be perfectly stored in your trunk or warehouse. Handle design makes carrying more convenient. Sougem is dedicated to producing and innovating in quality Barbecue products, Bakeware,garden tools and providing satisfactory service to consumers.Our products are approved by FDA.Our aim is: offering the best, safest and healthiest products to consumers. Sougem Portable foldable grill is suitable for 3-5 people barbecue party in a variety of venues. Let's get it and enjoy it, You will be love it. - You're Get 100% Refund if you are Not Satisfied with the Product or Service!